WORTH EVERY LITTLE CALORIE YOU SEE!!! A SALTY & SWEET PARADISE! CARAMEL, PRETZELS, PEANUT BUTTER, PEANUTS & CHOCOLATE ALL ON TOP OF A BROWNIE! Melt 1 stick of butter and stir in 1/2 cup cocoa powder. Add 1 cup sugar, 2 eggs, 1 tsp vanilla and stir. Add 1/4 tsp salt and 1/4 cup flour and stir. Pour into 8x8 line with nonstick foil and make 30-35 minutes. Sprinkle 2 cups salted pretzels, coarsely chopped on top and lightly press. Melt 11 oz caramel bits wit 2 tablespoons heavy cream. Stir in 1 cup chopped and salted peanuts. 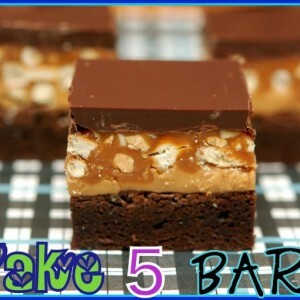 Pour on top of the brownie bars. Melt 1 bag of Ghiradelli bittersweet chips and pour over the bars. Chill until firm and cut into bars.